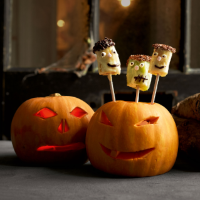 These halloween treats a great fun to make with children. Put the white and plain chocolate in separate heatproof bowls and melt very gently, either over a bowl of simmering water or in short spurts in the microwave. Scatter a little of the chocolate-flavour strands and popping candy into 2 small bowls. Put the plain chocolate in a Cooks' Homebaking Piping Bag and snip off the smallest tip possible so the chocolate can be piped in a very fine line. Cut 3 chunky pieces from each banana and press a cake pop stick about three-quarters of the way through each one. Working over the bowl of white chocolate, spoon a little over a piece of banana to cover. Let the excess chocolate drip back into the bowl and transfer the banana stick to a tumbler while you coat more pieces - dipping about 3 pieces at a time so they start to set slightly, but do not become completely firm. Repeat with each kiwi. Before they set, dip the tops in chocolate strands and popping candy. Slice the marshmallows and position for eyes. Pipe large blobs of chocolate for the centres of the eyes, or secure pieces of popping candy by moistening the marshmallows with a drop of water so they become sticky. Pipe a mouth and stitches onto each face.